Born in Suffolk, England, in 1753, Elizabeth was one of the nine children of John and Mary Rushbrook Simpson. The Simpsons lived in poverty on a small farm. Throughout her childhood, Elizabeth had aspirations to travel and at age twelve exclaimed that “she would rather die than live any longer without seeing the world”. At age eighteen she made her first visit to London where her brother, George, was demonstrating an interest in the theater. Soon after her return to Suffolk, Elizabeth longed to go back to London. She left a farewell letter to her mother, secretly packed her things and ran away. The major reason for her leaving was to follow her dreams of the stage. Soon after her arrival in the city, she was wedded to the established and professional actor, Mr. Joseph Inchbald. The Inchbalds were not known for being happily married, but it was through her marriage that Elizabeth was introduced to – and was able to establish herself as – an actress in the theater. After the sudden death of her husband in 1779, she was forced to make her own living in the theatrical world. Known as a great beauty and a fine actress, Inchbald soon realized that she would live a life of poverty in the profession, so she began to abandon her acting career and commenced her life as a playwright. Inchbald was a prolific and successful writer, producing fifteen plays between 1785 and 1794, only one of which went unpublished or unstaged. Inchbald is remembered for being the first to use the stage to portray “life as it is lived” to the theatrical world. In Such as Things Are she focuses on a modern social thesis, as opposed to using her work for political propaganda like so many of her colleagues. Drama in support of a social campaign was a new concept and was encouraged by Inchbald’s supporters even in the face of highly critical reviews. 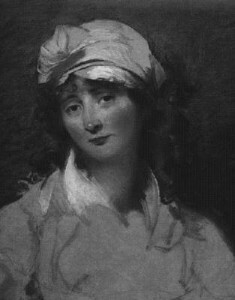 Elizabeth later went on to write numerous plays and became the first prominent British woman critic. Her play critiques stood out from others for not only representing her views, but that of the whole audience. Her published critiques include British Theatre and Collection of Farces. In her later years she was highly regarded in the intellectual community. Having written five novels and twenty plays, she spent the last two years of her life at Kensington House where she died on the first of August, 1821. TBA by Elizabeth Inchbald Directed by Marcy Arlin of Immigrants Theatre Project at The Drama Bookshop(250 West 40th Street (between 7th & 8th Ave)) 212 9440595 x417 on Sunday, May 4, 2003, at 2 p.m. SUCH THINGS ARE Presented by Pregones Theater Company at 571-575 Walton Avenue, The Bronx 718 585 1202 on Friday, May 16, 2003, at 7 p.m. WIVES AS THEY WERE, MAIDS AS THEY AREPresented by New Georges at The Room: 520 Eighth Avenue, Suite 326 (at 36th St.) 646 336 8077 on Saturday, May 24, 2003, at 2 p.m.
TBA by Elizabeth Inchbald Directed by Leslie (Hoban) Blake and Blue Heron Theatre at Blue Heron Arts Center (123 East 24th Street) 212 332 0027 Date and time to be announced. I’ll Tell You What: The Life of Elizabeth Inchbald. Kentucky: Univ Press of Kentucky, 2002. The Plays of Elizabeth Inchbald. Paula Backscheider ed. New York: Garland, 1980. Roger Manvell ed. Latham: Univ Press of America, 1987.